"You have no idea what it means to really suffer, but you will. Just wait, you'll be sorry." John Pressman (Michael Lerner) is an opthamologist's assistant, though he's not a very good one. His manner with patients leaves a lot to be desired, and this results in his firing from his job. However, John's mommy Alice (Zelda Rubinstein, Poltergeist), believes he is a first class eye surgeon, and doesn't like the idea that someone would not like her son. She also possesses strange telepathic powers which she channels through a large snail shell, and is she is able to see through her son's eyes while he is under hypnosis. When she learns that her son has been criticized, she seizes power over him and sets him on a mission of murderous revenge, which includes carving the eyes from his victims. John begins his rampage and we are witness to his heinous acts and shown in full splendor his eye severing methods. However, if this weren't weird enough, director Luna adds another little twist to the film which I won't spoil here, but does add, shall I say, another dimension to the film when we are introduced to Patty (Talia Paul) and Linda (Clara Pastor). The film does exhibit an interesting style, and is fairly well executed. From a horror perspective, I didn't find there was all that much suspense built up throughout the course of the film, though the typical victims eluding their hunters is part of the plot. Gore is limited to a few scenes which are pretty graphic, so if you have any qualms about watching someone's eyes get cut out, you'd best stay away. There are some interesting elements to the film which do make it stand out from the crowd, and I would avoid reading many reviews or the IMDB listing for the film if you want to keep yourself spoiler free. This won't have you gripping the edge of your seat, but still makes for an interesting addition to one's horror collection, and is certainly one of the only films I can think of with this much occular violence. 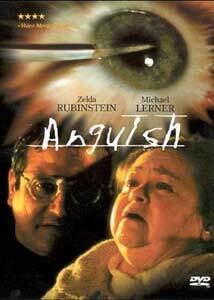 Image Transfer Review: Anguish is presented in its 2.35:1 theatrical ratio in a new anamorphic transfer. There is some grain visible, but the print is in fairly reasonable condition. Black levels are pretty solid, and colors, while not overwhelmingly saturated are fine for a film of this type. Some compression issues here and there, but overall a decent image for a film this age. Audio Transfer Review: A Dolby Surround 2.0 and a new 5.1 mix are provided, which are clear and free from any major defects. Primarily focussed on the front channels, there is some interesting use of the surround channels as the film progresses. The 5.1 mix is more effective in this regard. Extras Review: The film's Spanish theatrical trailer is the only extra, which is available with or without English subtitles, and is presented in anamorphic widescreen. The four page insert features the film's poster artwork, plus an essay on the film. Anguish, if nothing else, is certainly a unique experience. The scenes of eye surgery and the type of gore involved will be unacceptable to many. The twists do keep it interesting, but I would have a hard time recommending this for all but the serious horror and gore collector.